Are you having trouble growing your nails due to excessive breakage? Nails can be damaged by various things. Nails that easy break and are short due to lack of strength are sometimes exposed to too much water. Some of the abrasive chemicals found in nail polishes, nail hardeners and nail polish removers can be the cause of nails splitting and breaking. There are ways that can help improve the condition of these nails and allow them healthy growth. Taking a vitamin and learning easy techniques to protect the nail will help you achieve your goal quickly and completely. Be patient with the process of improving the state of your nails. Here are a few tips to help you grow your nails. Germs and bacteria collect and grow under nails. This is the most common reason to wash your frequently using warm water and soap. Clean under your nails and rinse hands well. After you wash your hands take every effort to dry them completely and thoroughly. Leaving hands wet is anti productive. Cut your nails after a bath or shower. 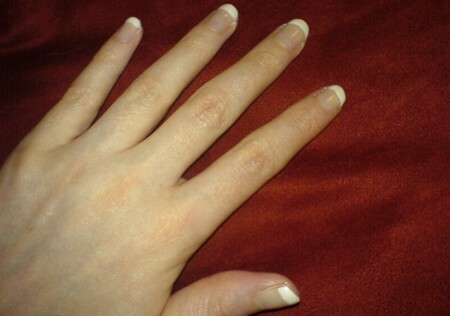 Nails are soft and easy to manage after bathing. Use the scissors that came with the manicure set to cut your nails, Cut the nail straight and file them. File the nail down and make sure the corners are smooth and slightly rounded so they won’t snag clothing or break. Moisturizing the nails are important. They condition the nails making them less susceptible to breakage and splitting. Apply a nourishing lotion to the complete nail. This step should be done every time you remove nail polish. Most polish removers are abrasive. Your nails will need the extra attention. Take precaution when you have a nail break or a hangnail. When caring for hangnails use clippers as opposed to tearing the healthy skin or biting it off which can lead to bacteria entering. Avoid biting the nails for the same reason. When bacteria invades the nail or the healthy tissue is damaged then nail growth can be slowed significantly. Take a multivitamin or supplement to help with your nail growth. Healthy nails start from the inside out. Supplements like Bioton, vitamin C and vitamin A may help improve nails strength and allow your nails to grow healthier. Avoid nail products that may be damaging to your nails and consequently nail growth. Some nail polishes and hardeners contain Toluene, Formaldehyde and Sulfonamide. These substances are known to be irritating to the healthy skin surrounding the nail.